Love is all you need. The Beatles said it best, and we echo the sentiment with the world’s best word spelled out beautifully in scripted silver lettering. It’s perfect for every romantic-at-heart – in other words, every woman! The necklace is an ageless and timeless piece that she can wear for any occasion and every season. 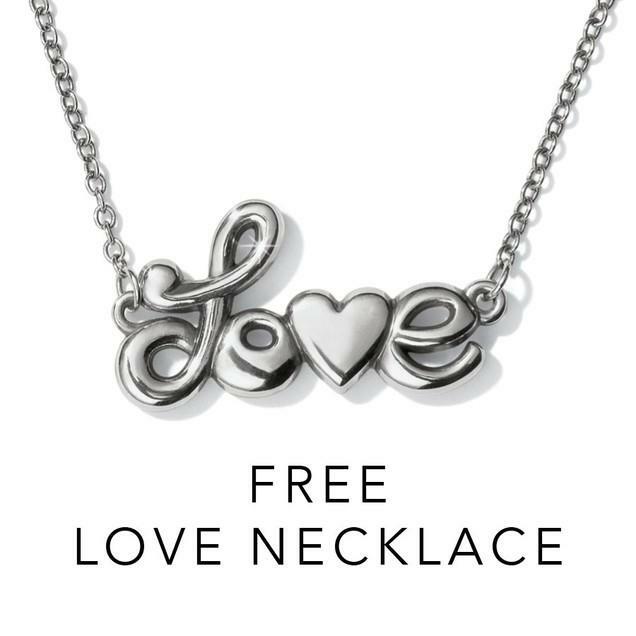 With a single, same-day, in-store Brighton purchase of $100 or more receive this Love Necklace absolutely FREE*! Retail value $42. *Limit one per customer, while supplies last. Purchase total includes merchandise only. Gift Cards and sales tax not included. Cannot be combined with other offers. At participating retailers only. Offer valid until August 19, 2018.